Club Penguin Cheats by Mimo777 Club Penguin Cheats by Mimo777: Club Penguin Partying Ninja News! Once again, Club Penguin in making sure everyone knows about their 5th Anniversary Party. This one day only party will be on October 24! There will be cake, a new party hat and, of course, a new Yearbook added to the Book Room! You will want to make sure to get an Anniversary party hat, because they are the most rare item on the island since they are NEVER repeated! 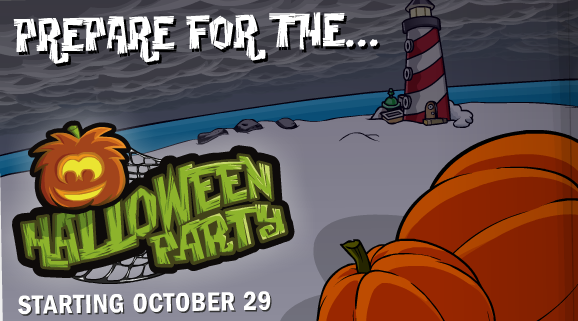 This year's Halloween Party will begin October 29th! 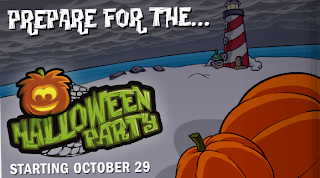 Be prepared for lots of spooky fun! The Halloween Hunt will return this year. This week, The Club Penguin TImes has a lot about Ninjas. Even Aunt Arctic is talking Ninja! This can only mean one thing... Card-Jitsu update coming soon! Woot! Wow, so much fun coming to the island! I an SO looking forward to them all! How 'bout you? What are you most looking forward to? kool post mimo btw when is the winner of the camp pete party being anounced? hey mimo do u think that sunsai will return for the nings to meet like when card fire came out let me konw. I'm looking forward to it to! I'm a fire ninja aswell. It's going to be great! Me too! I love the cake! Guys, remember the calendar Mimo posted was for 2011! So this year, there is Card Jitsu Ice? The pictures only depicts Card Jitsu Ice. In the picture there is a ice ninja. Look at the snowflakes. Just saying. Anyway, gotta do my homework so bye for now! Hello, Anonymous/Averityorla1! Yes, there'll be a Water Dojo, possibly the waterfall! I don't know what I'm most looking forward to. It all sounds so awesome! Two parties and a new game! Awesome! I can't wait! I became a Fire Ninja less than a month ago! I'm so excited! Go Water Ninjas! Go Water Ninjas! And all the rest of the ninjas! (Regular, Fire, Ice)(2011). I can hardly wait until they are here in Club Penguin! That's so cool that the Snow Ninja thingy is coming out....? Cool I didn't know that. Thanks for the information! I think he will. I've never met him before. Have you? Whether ice or water is coming, I`m super excited! Also, it kind of doesn`t matter which one it is because ice is just frozen water. (: There`s probably going to be a secret message in the newspaper soon... like how you click on a word and it gives you a note for secret agents or ninjas. So much awesomeness! I can't wait for all of it! I'm pretty sure that there will be a water dojo. I think he will come out to meet. Halloween deffinantly! I can't wait to see the prize you get! Hope you give us a halloweenie challenge (like maybe instead of giving us direct answers to where the treats are, you could give cheesie clues, like if the first one was in the coffee shop you could say 1. Java, tea, couch.